Hey there fellow photo-artists - it's time to showcase your work here in our little virtual art gallery! Did you have time to experiment with some new styles, forms, tools, compositions this week? Don't you love the gratification that comes with the mastery of a new skill? I don't even have to totally master a skill to feel gratified. Just getting familiar with a new photoshop tool or trying a new form of photo art gives me a shot of 'let's keep going' encouragement. The piece I am sharing today is a tiny experiment with something I have never tried on a piece of photo art before. I am light years away from 'mastery' or 'competence', but I am pleased with my first try and, therefore, encouraged to keep working on the skill. This is the photograph (already having had some manipulation in PSE) that I used as a canvas for experimenting with something new - for me. 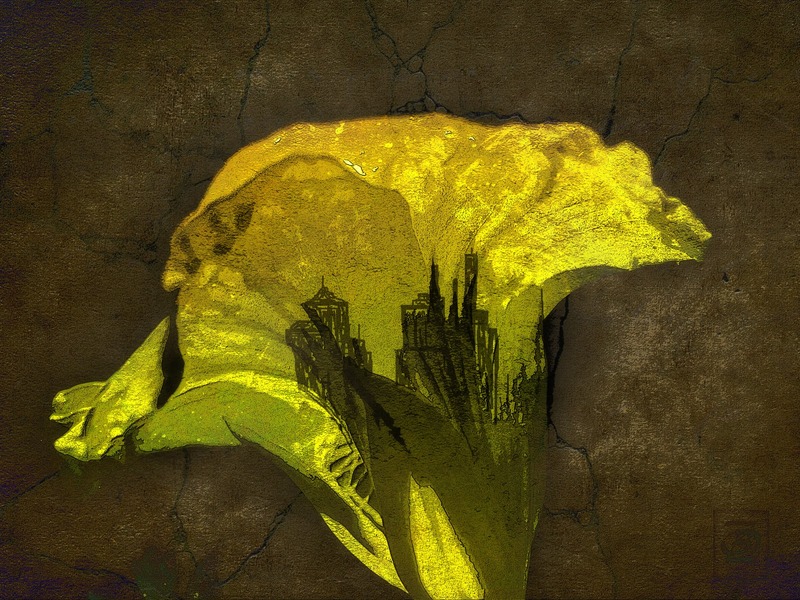 The black marks on the flower in the original piece of photo art reminded me of buildings. So my idea was to experiment with my Wacom Bamboo pen and tablet (which has sat quite unused on my desk - for months) to turn the black marks into a bit of a cityscape within the flower. A couple of new textures (as yet unreleased) were then added to produce different backgrounds. This version is my favorite. To my eye, the grey background works best with the yellow flower. If you encounter any problems with a download, could you let me know about it in an e-mail so that I can work out and eliminate any glitches in the process? Thanks so much! Quick feedback like that will not only help me, but all who like to collect new textures for their texture libraries. 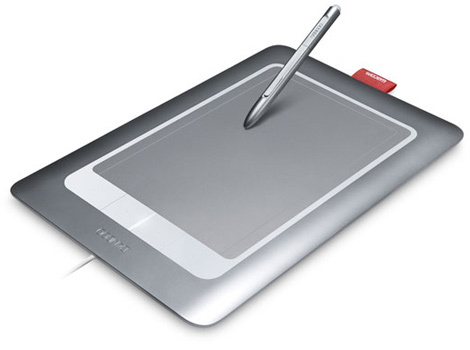 I have never heard of the Wacom Bamboo Tablet, it seems to be a very interesting tool. The buildings in the flower are fabulous - I like that effect a lot. And what a gorgeous texture on that last picture!! I apologize for not including a photo and link of a Wacom Bamboo Tablet. I have corrected that in the post if any of you early visitors would like to go back to check it out! Thank you so much for your kind comments on my image. I love what you did with this Bonnie. Thank you for hostessing, and have a super weekend. Hi Bonnie! I jump-started my day here looking for everyone. Am just getting used to the fact my Friday starts much sooner than yours. Love what you did for today's show 'n tell; placing the little township inside there was very creative! Did you actually draw them in with your bamboo pen? I hope you'll leave some tips as you find your way with the tablet. Wow - looks like lots of you own a tablet. I don't but wonder if a similar effect could be achieved by those of us with less drawing ability just by overlaying a city photo and manipulating it. I may have to give it try using my reduced techie abilities. This is just so cool and I absolutely love the idea of hiding a city, a mountain range, a face...whatever... inside flower petals. I think your first effort is fabulous and definitely worthy of continued use! I love what you have done with your flower, wonderful creation. The pen and tablet sound like an interesting tool for more detail work that the mouse can't handle. Wow! You are so talented and creative. Love what you've done with this piece. Really gorgeous photos with a beautiful light and texture. There seems to be a town in the interior of the flower. What a wonderful creation! You are so creative! Have no problem downloading your textures. Wow, its wonderful with the little drawing inside. Photo Art Friday is a fantastic exhibition. Have a nice day, Bonnie. i have no idea about working with such a tool... but: your skyline in the flower is such a gorgeous idea, fits perfectly!! and thanks for the wicked texture of this week... i already used it and it is truly great! You truly inspire me...I can't wait to see what you've created each week. Thank you for sharing your beautiful work! This is really breathtaking, Bonnie! I love what you've done with the cityscape. You've inspired me to start using my wacom tablet (which also sits on my desk, unused). 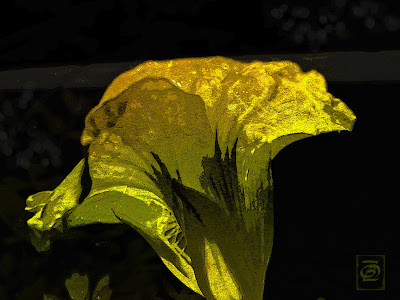 So beautiful the yellow flower against the dark background, and as a little fun detail, a new pattern into the flower. Stylish! Okay, Bonnie this is just too cool! I didn't even know you could do such a thing. And I agree with you, my favorite is the last one with the grey background!! Beautiful!! Bonnie, this is superb work. I love how your mind's eye works. The cityscape in the flower is so unique and creative. And you've used one of my favorite colors -- acid green. I so enjoy this group and look forward to the weekly entries. The art work this week is all mind-blowing! Beautiful artwork! I love how you transformed this already beautiful image into an incredibly awesome work of art.